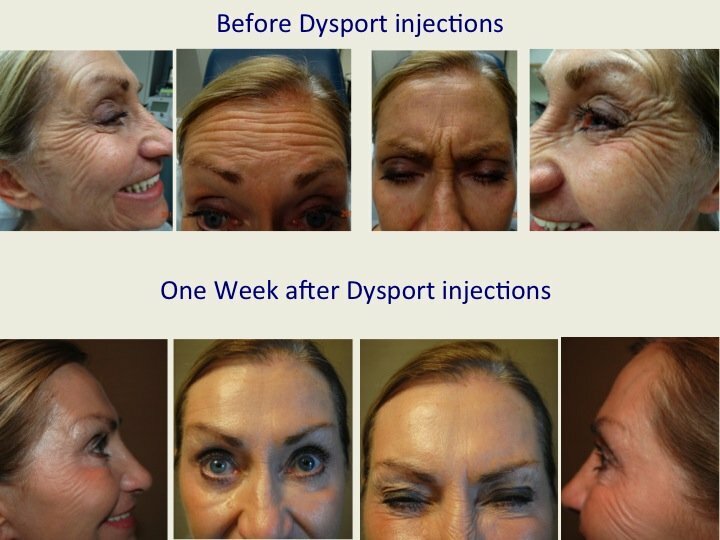 Dysport (Botulinum Toxin A) is FDA approved to treat facial muscles that cause wrinkles and frown lines. Although approved in US in 2009, it’s been used in Europe since the 1990s. Therefore, it’s safe and effective. Similar to Botox, it treats dynamic wrinkles – those wrinkles and lines that are caused by muscle movement. Dysport is injected directly into the muscles that cause wrinkles and relaxes these muscles so that they can’t contract. This, in turn, relaxes the frown lines and wrinkles. Dynamic wrinkles and lines are caused by repeated movements of facial muscles over time. These cannot be prevented by diet, hydration, skin care, or exercise. Genetics play a big role in development of these wrinkles – some patients develop frown lines in their twenties, while others are perfect well into their fifties. Our doctors often recommend treatment with Dysport for those patients that want to prevent these lines in the first place. The most pronounced dynamic lines are the deep wrinkles commonly found on the lower forehead between the eyebrows – this is known as the glabella region. These lines are sometimes called 1’s, 11’s, or 111’s – one, two or three frown lines are present in the middle of the forehead. Lines across the forehead and around eyes (smile or laugh lines) are also common. The main use of Dysport is to decrease or erase moderate wrinkles and lines in the glabella, forehead, and smile lines around the eyes. It can also be used to treat neck lines, known as bands. Dysport, like Botox, can also make one look less tired, angry, or worried, and make one look more refreshed, younger, and more youthful. The beauty of Dysport is that it’s a soft change, so your friends and family may not even realize that you’ve “had work done.” Instead, patients often tell our doctors that their friends and family think they simply look better, less tired and more refreshed. Our doctors will discuss your beauty goals before the injection to ensure that the treatment will help you achieve the desired effect. Our doctors have used Dysport in both, male and female patients. Although male and female patients may have different goals, Dysport can be used safely to achieve the results you desire. For example, in addition to erasing the glabella, forehead and smile lines, female patient often ask our doctors to achieve a slight brow lift. This can easily be done with Dysport in most patients. Male patients, on the other hand, may want a more masculine look – a more relaxed forehead with flat eyebrows. Our doctors will make sure that your treatment is right for you. You will begin to notice a difference within a week of your injection and the maximum results will be seen approximately 2 weeks after the treatment. The length of time Dysport “lasts” depends on the patient. Some of our patients require the treatment only twice per year, while others come in regularly every 3 months. Thirty minutes before your injection, your doctor will apply a topical anesthetic to make the procedure virtually painless. Contact Goldenberg Dermatology today to learn more about Dysport and to see if it’s the right treatment for you.